When you first sign up on Twitter, you’re greeted with a list of categories to choose from that describes your interests. Those categories include everything from music to sports and news. The point of this is to tailor your experience to fit your needs. Unfortunately, there isn’t a category for social media or digital marketing. Luckily, we have you covered! Whether you’re just getting started on Twitter or have been looking for new accounts to follow, give any of the people or brands on this list a try! Peg Fitzpatrick is the co-author of “The Art of Social Media: Power Tips for Power Users.” So it’s no wonder why she’s so dominant on Twitter. Fitzpatrick’s Tweets are a combination of curated blog posts and engagement with other accounts. Not only will you learn a lot from the links she shares, but you can also take a note from the way she shares content. Notice how she Tweets a lot of lists and actionable blog posts. This is the type of content that followers like to read, which entices people to keep following her. Guy Kawasaki is the other co-author of “The Art of Social Media” alongside Fitzpatrick and he is well respected as a marketing genius. Kawasaki has worked with top companies including Apple and Mercedes Benz. He’s currently known for being the chief evangelist of the graphic design tool Canva. Unlike Fitzpatrick, Kawasaki doesn’t Tweet about marketing very often. The reason he’s a great Twitter account to follow is because he understands shareable content. Guy sends out more Tweets in an hour than a lot of companies send throughout an entire day. However, he still manages not to oversaturate his 1.46 million followers. Why? Because he knows what type of content his audience likes, and he delivers it to them. Find out what type of content your audience prefers and start sharing it on a consistent basis. Rand Fishkin is the founder of Moz. He is one of the top search engine marketing experts in the world and his Twitter account proves that he knows a thing or two about social media marketing as well. What Fishkin does better than most people on Twitter is straying away from the generic “headline + link” Tweet formula that has become the standard for social media marketers. Instead, Fishkin provides context for the links he shares, and also Tweets out a lot of great tips. SEO is something every marketer should understand, and Fishkin is the guy to follow on Twitter to start learning. Danny Brown is a blogger, marketer, author and social media pro among other things. What separates Brown from other people who write about social media marketing, is that he weaves stories into the content he shares. Similar to Fishkin, Brown breaks free of the traditional click-bait formula for his Tweets and his blog posts and is still able to be successful. One interesting thing about Brown on Twitter is he takes advantage of a seldom used feature, which is polls. 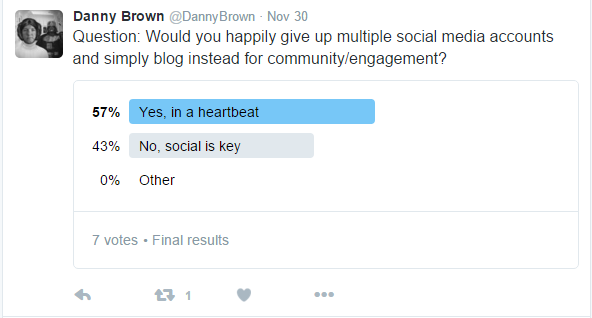 So few accounts use Twitter polls, but they are a very effective way to engage with your followers and get useful information that you can use to produce better content and products. Content marketing has been an extremely hot topic over the past couple of years. One of the people who has been leading the charge for this growth is Jay Baer. He is the president of Convince & Convert, which is a great resource for all things related to content marketing. Baer shares blog posts about content marketing and social media marketing on Twitter. He also uses hashtags wisely, and is careful to @mention the sources of the content he shares, which is a great way to make new connections and get engagement for your Tweets! Andrea Vahl is an authority on Facebook marketing, but she’s also very active on Twitter. Vahl is one of the genius minds behind the book “Facebook Marketing All-in-One for Dummies”, and the creator of the entertaining Grandma Mary Show. On Twitter, Andrea shares a mixture of curated posts from other sites and her own content about social media marketing, with a focus on Facebook. Even if you’re not a big Facebook user, any social media marketer can get value from Andrea’s Tweets. The best Twitter accounts are fun, engaging and educational. That’s why Suzi McCarthy is someone worth following. McCarthy is a blogger and the senior social strategist at the content marketing agency PureMatter. You might expect McCarthy’s Tweets to be filled with the latest blog posts related to social media. While there are definitely a fair amount of those Tweets, you’ll also get content about business, sales and interesting headlines from around the world. Mashable has grown to be one of the biggest blogs in the world. In addition to the main @Mashable Twitter account, the company also has a separate Twitter handle strictly for social media news and tips. Mashable SocialMedia is a great account to follow if you want to know what’s going on in the world of social media outside of just the marketing aspects. For instance, you’ll see Tweets about changes to Facebook’s layout, new social media platforms and other content that’s important for anyone involved in social media. Rebekah Radice is well known for her social media prowess. Not only does she have one of the top social media marketing blogs, but she also puts her own advice into action as you can see on her Twitter account. When you follow Radice, you’ll get great social media marketing tips along with curated blog posts to help improve your entire marketing strategy. Aside from the content that she shares, you can also get value from looking at the way Radice Tweets. Her Tweets are engaging and well structured. The Entrepreneur brand’s Twitter account is jam packed with content that’s not only helpful for business owners and entrepreneurs, but social media marketers as well. Entrepreneur has been publishing excellent content for over 25 years and its Twitter account offers an endless stream of its top articles and videos. Most of the content Entrepreneur shares is from its own website, which means you get a healthy balance of marketing tips, productivity hacks and other content that will help you grow all aspects of your business. Gary Vaynerchuk doesn’t Tweet a lot of links to social media marketing articles. However, what you can get from following him is a better understanding of how to use Twitter effectively by scrolling through his activity. For instance, a lot of marketers and businesses don’t take the time to engage with their followers. Not only does Vaynerchuk reply to Tweets, but he takes it a step further by taking advantage of Twitter’s often overlooked video feature. That personal touch not only helps Vaynerchuk’s account stand out, but it also keeps his followers engaged. Twitter is great for keeping yourself entertained and staying up to date on trending topics around the world. If you’re just starting Twitter or looking to follow some influential people in the industry, start with these 11 handles. You’ll get even more from the platform by learning more about social media marketing and getting inspiration to grow your business. While you’re adding all of these new Twitter accounts, don’t forget to follow @SproutSocial on Twitter for the best social media marketing content from around the Web!